Originally published at Pediatric EM Morsels on November 1, 2013. Ventriculo-peritoneal (VP) shunts have greatly benefited many children with hydrocephalus. Unfortunately, VP shunts can have complications… and we have discussed some of them before (Tapping a VP Shunt). The evaluation of a child with a VP shunt who is not critically ill (and not in need of having the shunt tapped emergently) often involves obtaining plain films of the shunt as well as a head CT to assess ventricle size. This, unfortunately, often leads to numerous CT scans in a child’s life, which, as we know (Medical Radiation Exposure) can be a big deal. Is there any other option to assess ventricle size for kids with VP shunts? The National Institute of Neurological Disorders and Stroke estimate that hydrocephalus affects ~ 1 in every 500 children. Children with hydrocephalus get many neuro imaging studies. They get routine surveillance images. They get emergent imaging when there is concern for complications. Koral estimated the “mean annual neuroimaging study frequency” as 2.1. Children are at greater risk of developing a malignancy form medical radiation than older patients. From a population standpoint, the use of CT imaging for this population generates a lot of potential risk. Seems like the “Rapid” and “MRI” do not belong together… but, in fact they do… and have been possible for several years now. Requires sedation (which is suboptimal when you are in need of re-assessing the kids neuro status). Individual image slice acquisition time = 500 msec… roughly equivalent to one rotation of CT scanner. Ashley’s total procedure time was 2.5 times longer than CT, but also generates images in three planes. Miller’s total scanning time was ~150 seconds. Due to speed, it does not require sedation and can render high-quality images that are free of motion artifact. Majority of study populations have been with children less than 5 years of age! At institution where Ashley’s research was done, cost was $120 more than CT ($900 vs $781). Significantly less than standard MRI ($1718). Obviously, these costs are institution dependent. Can image the ventricles well. Some studies show a decreased ability to visualize the catheter. There are various protocols that are being looked at improving the ability to define the catheter location. “Steady-State Gradient Recalled-Echo Sequences” in rapid MRI protocols have been found to be able to better delineate the shunt catheter than “standard” rapid MRI. The literature would support the use of these rapid MRI protocols. Your specific institution and your neurosurgeons might not. 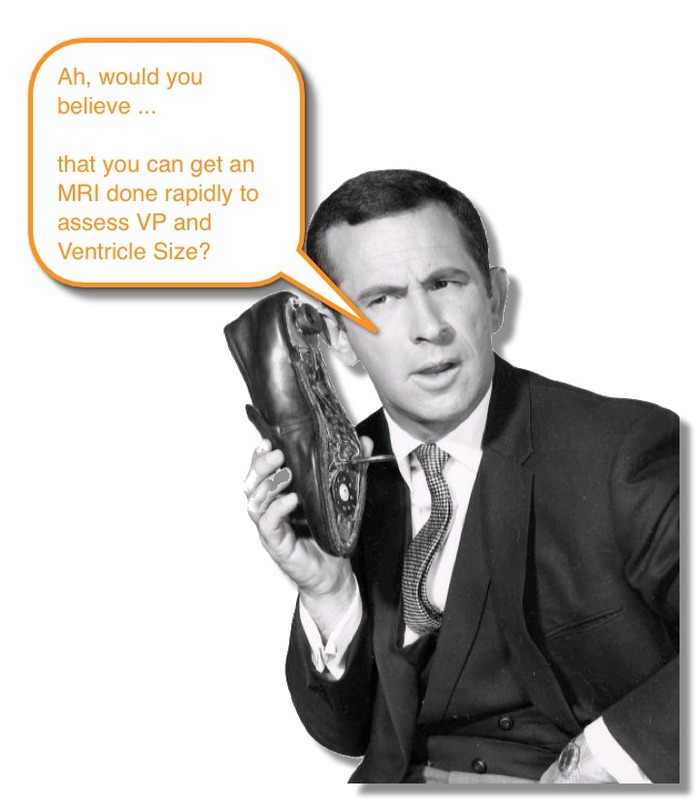 But, in an effort to continue to image responsibly (along the lines of the Image Gently campaign), it may be useful to discuss with your teams the use of rapid MRI in the evaluation of patients with VP shunts. Formatting modified for continuity with emDocs site. Excellent review. It’s so easy to just order the CT and not think of the long term consequences it may have. Neurosurgery at my facility still has not bought into the rapid sequence MRI, but hopefully they will come around shortly as evidence supports it. Then again, they still give Keppra to everyone.